What others should know: I'm not getting anything close to the advertised 750 fps. I thought I'd get about 575-600 fps with normal weight lead pellets but I chronied with two different bottles on two different days with similar results. I'll be shooting this in my basement throughout the cold months so it doesn't matter much now. I'm not sure how much the fps will go up in 70-90 degree days we get around here in the summer. But I've got other fine rifles for longer distances when outside. My grandsons are going to love shooting this rifle when they visit next summer. Things I liked: This is a really cool gun to shoot. It feels solid and well made, and if it functioned properly I'd give it 5 stars. What others should know: I was extremely excited to shoot this rifle. It looks and feels realistic with the full metal receiver. However, with only 300-400 rounds through the gun, it starts to misfire. The only way to get the trigger to be responsive was to charge each round. Pyramid Air have been fantastic, standing by its warranty. I returned this gun 3 times for a replacement and I just returned the 4th for a refund as I have no confidence the gun is reliable. I intend to purchase another rifle through Pyramid because its customer service has been exceptional. Unless Sig Sauer fix the obvious design flaw in the trigger mechanism, I would not advise anybody to purchase this gun. Things I liked: Excellent Rifle! This along with the Umarex Steel Force make for great shooting companions. I love the weight. The scopes well suited for the gun as well. Things I would have changed: The cylinders gas out quickly. Also wish there were more rounds on the belt. What others should know: Go ahead an order an additional magazine, which comes with three additional belts. The loading was originally a drag (using fingers). I'm using a nail tip now to manually load them, and it's a lot smoother. I read the reviews initially and was concerned. I took a chance and glad I did. No problems at all with this rifle (so far). Things I liked: This review is just my one time experience and should only be taken as such. I say this because the gun I purchased was defective right out of the box. However I did really like the look and feel of the gun. It had a nice weight and balance to it. It did not feel like a cheap plastic gun. Unfortunately the looks and feel were the only this I did like. Please bear in mind that it was a defective gun, so that may well explain much of my dislikes. Things I would have changed: The gun I received would jam on every magazine. Maybe I could get off a few shots before the jam, but eventually it would jam before I could get 8 shots off. Also once it did jam, it was extremely difficult to remove the jammed pellet as the magazine could not be released either. I would also add that the trigger pull was really bad on this gun. I believe that is because you are cycling the magazine for the next shot. This in turn made the accuracy of the gun really bad. What others should know: Pyramid Air honored their return policy and gave me a full refund. I did not get a replacement mostly because I was concerned about getting another defective one and also because I did not really feel the gun was a good value for the money. Once again my opinion is solely based on a defective product, so please bear that in mind when reading this review. I too had the same problem, sent the gun back. PA sent me a new gun and I did not get a chance to use it before me 30 days were up. The second gun does the same thing with jamming every 5-8 shot. Very frustrating, not sure what to do now? I believe that your gun was not defective but there is a design flaw in how the pellet belt is cycled. I experienced the same problem as you. Since there is no indexing stop for the pellet belt to stop exactly where the barrel and air outlet are aligned your trigger pull and release can/will vary the location in which the pellet belt stops when it is fired. This in turn causes some pellets to be fired in a misaligned position that slightly leaves the pellet belt and partially enters the barrel causing a "jam". At this point the trigger will not cycle the belt and the magazine can not be ejected until you force the pellet back into the belt and clear the jammed pellet from the barrel. Things I liked: being a retired soldier, l love the weight and feel of the weapon. Built quality is very high. Can't wait to take it to the range on base. Buy it , you will not be disappointed at all with this product. l ordered the .177 version and plan to order the .22 version also. Things I liked: The weight and feel is like a real combat rifle. The accuracy is quite good. It's a great package. Scope is not the best but for the price, not bad. Things I would have changed: The belts are not easy to load for a .177 pellet. Placing the pellet in the belt slots and then you need to seat them with a provided tool which takes time. It would be nice if the rifle sold with two belts. The guns shoots nicely and you go thru allot of pellets so changing out and reloading is a pain. Two belts would help. What others should know: The advertised velocity is 750 fps and yet the real velocity was around 400. I paid for the $10 for 10 and my results were averaging around 400 fps. Poor advertising by Sig Sauer. I told Pyramid Air as to why this difference in velocities? They told me that it wasn't only mine that shot low but all of them did. They said Sig told them that you get what you get with no explanation as to why the difference! I believe Sig is using their 5.56 alloy pellets to get their advertised velocity. I haven't done any chrony work but if you use the standard .177 JSB Exact 8.4 grain pellet the fps would definitely be less. Another reason for the lack of speed could be the inefficient and inconsistent magazine belt tension (holding the pellet), belt/barrel and belt/air source alignment. Dependent on how the belt cycles to the firing position (which there is lots of leeway) the air source, pellet and barrel are not always in perfect alignment and there is no complete seal between them so lots of air pressure is lost during the shot. Just got mine, no scope and have not shot it yet however my initial look over revealed a loose inner barrel...unscrewed with two fingers, found remnants of... locktight? on threads. Also the inner barrel kind of free floats in the mock silencer end cap. These items may? have some effect on FPS and accuracy. I will try to use a metal tape shim to snug up the barrel in the cap. Also, the end cap did not automatically center up the inner barrel when I reinstalled it and jammed up on it. You need to back it off a few times during tightening to kind of wiggle it in place or use a pencil to keep it centered. Things I liked: There rifle itself is quite satisfactory. Size, weight, appearance, trigger, loading pellets--all good. Be sure to read the pellet loading instructions carefully and notice how the chain for the pellets fits into the magazine before you remove it from the magazine for the first time. Takes a bit of effort to start the thread of the CO2 cartridge. Rifle arrived yesterday and today I shot 7 mags of 30 as per the written suggestion in the manual. No appreciable dropping of the point of impact with the final magazine. Perhaps there was enough CO2 left in the bottle for another 30 shots but I didn't want to court trouble with a jammed pellet. Accuracy was good for a CO2 pellet gun. From a rest almost all shots hit a 3" bullseye and most were inside a 2" bull. I tried JSB RS, Express and Exacts. The Exacts are the ones I will shoot in this rifle although the Express worked well also. I will shoot another bottle or two before I check the gun with the chronograph. Things I would have changed: The included scope was in no way acceptable to me. A good sight picture at 1X but as I zoomed towards the 4X end the sight picture progressively shrank. It was like looking down a long tunnel, no matter what eye relief I tried. The scope directions indicated a 3.75" to 4" eye relief but the tunnel stayed no matter what eye relief I tried. I should have guessed that at the price point of this scope, it wouldn't be much, but I didn't think the scope would be useless to me. Save your money and get the rifle with a red dot or open sights or put your own scope on it. 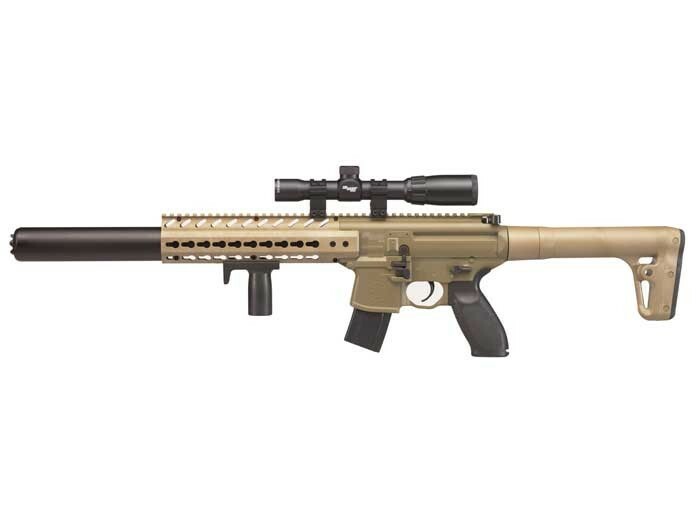 What others should know: I put a Hawke 2 - 7 x 32 scope on the rifle using the mounts that came with the gun and the scope problem was solved although I was out the price of the Sig Sauer included scope. No noticeable recoil with this rifle so I would think the choice of a scope is broad. Things I liked: The weight of the rifle is right on. Things I would have changed: I would add a 3 shot auto burst and with the safety selector in auto. I would have the supperessor work like the Air-Force rifle after-market ones that you can get online. I would like that a second ammo belt would have come with the rifle so one person could be shooting as another person can be reloading. Add a arrow to the Magazine for when removing and reinstalling the ammo belt. What others should know: It's fun to shoot with accuorry. Buy the CO2 air bottles in bulk you'll need them, because the fun runs out when the CO2 is gone.. Shoot Safely with fun. I bought. I have a question. the rifle is designed for 15,000 shots. how to care for a rifle? need to lubricate. how to lubricate the receiver mechanism?